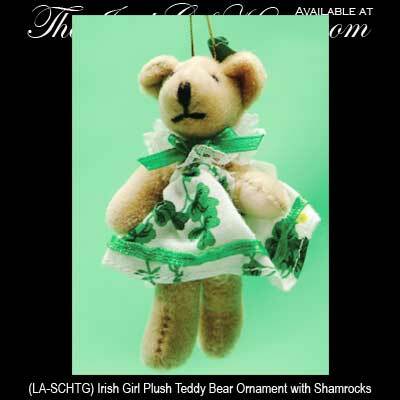 This Irish Teddy Bear ornament would also make a great St. Patrick's Day decoration. This Irish Christmas ornament is little girl Teddy bear that features a green accented satin and cotton dress that is decorated with shamrocks. The 4" tall Irish Teddy bear has jointed legs and she is ready to hang with the included ribbon. The Irish ornament Teddy bear is made in Ireland by Liffey Artefacts and she is gift boxed with a shamrock history card, complements of The Irish Gift House.